Listening is one of the four parts of the IELTS exam and it is the same regardless of whether you choose to take the academic or general test. It is comprised of four sections and you will be asked a variety of questions on these listening passages. You can expect to hear different accents and different types of materials, from phone conversations to lectures. There are forty questions and you have forty minutes to listen and answer. In this article, I will give a complete guide to the IELTS listening exam. You can find useful hints and tips for IELTS listening elsewhere on this site. The IELTS listening exam is the same for both the general and academic IELTS tests. It requires no specialist knowledge in order to pass, and is a good test of your overall English ability. Sections one and two are in a social context but the third and fourth sections are usually located in an educational facility, and have an academic context. I shall explain more about this, in detail, later. Importantly, you will only have one chance to hear the recording and choose a correct answer. You will be given some time to read the questions prior to actually listening to the recording. You should note your answers on the question paper, and then transfer them during the final ten minutes to the answer sheet. Copy the answers carefully, paying attention to spelling. Make sure that you enter the right answer for the right question number. Hint: Use your time wisely. When you are given time before a new section starts, don’t check answers from the previous section. Instead, read ahead and predict the sort of material you will hear next. For example, if there is a $ before the blank space, you will be listening for a number. Think about themes and content, as well as the specific answers you should listen for. You can use the time at the end to check spelling and review your answers. There are four sections to the exam, and each is little more difficult than the one before it. This means that the first section is the easiest and the last is the most difficult. In this regard, it is the same as the speaking exam. There are ten questions in each section, making forty questions in total. The first thing that you will hear is a set of instructions and an example answer, which is also marked on your question paper. After that, you will soon begin section one. The British Council (who run the IELTS exam along with Cambridge University) offer free practice tests like this one. You can practice your listening skills here, or buy the official exam papers. Next is a monologue, which means just one person speaks. This is again a social setting and typical examples include someone giving details about services, arrangements, or facilities. It will be something of general interest. 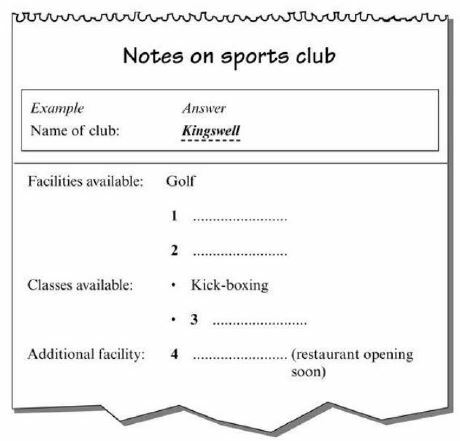 You can expect different types of questions, and one very common question type in section 2 is filling in a table with the correct information. Now we begin the academic half of the listening exam. In section 3, you will hear a conversation between two or more people talking about something related to education – maybe a college assignment or a post-lecture discussion. There can be up to four people talking, and you will most likely have to track their attitudes and opinions. You should also be aware that you may need to record factual information as well. The final section is the most difficult one, and is a monologue set in an academic context. It will be related to section 3 and may consist of a lecturer or other speaker giving an informative talk on a set topic. You will not need to know anything about the topic in advance in order to get the questions right. You will, however, need to gather factual information and identify attitudes and opinions. I made this video to help you better understand the IELTS listening exam as a whole. It should be very helpful for students who haven’t yet taken the IELTS, and just want to get a basic understanding. You will have noticed from reading the above guide that the IELTS listening exam, although difficult, is actually quite predictable. It is easy to prepare for it because it doesn’t change much. Thankfully, there are only a limited number of question types, too. Some of these are similar to the questions you are asked in the reading exam, while others are specific to the IELTS listening. I will look at some of the more common ones. This is a very common question type, so you really should practice it often. In this type of question, you will be given several possible answers. You may be given a simple question or else the first part of a sentence. It is also possible that you may have to choose more than one answer, so read the instructions very carefully. What is John going to do before the course starts? Hint: If you don’t know what the answer is, think about what is not correct. If are certain that C is incorrect, then you can guess at either A and B. Never leave a question unanswered. One of the more challenging questions in the listening exam is labeling a map, diagram, or plan. In this case, you need to listen very carefully and follow the verbal description well enough to associate it with the visual representation. This requires the ability to follow instructions and directions, or determine spatial relationships. There are many variations on this, but quite simply you will be given some sort of incomplete information and asked to complete it according to the information in the listening passage. Perhaps it will be a note or form that needs to be filled with names or numbers. In other cases it is a more complex flow chart that needs you to listen for stages in a procedure. You must make sure to stick to this as any answer with too many words will be marked as incorrect. This is something many students find to be difficult as you are asked a question and required to listen to find the words in the recording. You will again be told the maximum number of words you can use, so make sure not to exceed that limit. Because of the nature of the question, the answer will not be too complex. Instead, expect questions like “Who…?” and “What time…?” that require only one or two words as an answer. Each question is worth one mark, so you will be given a mark out of forty for your IELTS listening test. This is converted to a band score of between 0-9. You can calculate your band score from the number of answers you get correct. Do plenty of listening practice under exam conditions and you will get a good idea of what your band score will be after doing the real IELTS exam. You may hear speakers from the U.K. or U.S.A., as well as Canada, New Zealand, Australia, or South Africa. Some students practice listening exclusively to American TV or BBC News and so they are confused by the other accents. However, English is an international language and you should be familiar with these accents at the very least. The speakers will speak clearly and in standard English, so there is no new slang or technical jargon to encounter. The IELTS exam is, to some extent, also a test of your thinking skills. Sometimes there are answered designed to trick you. It is not always straight forward. You may have to think carefully about a question and the answer may appear to be one of two possible answers, but only a very careful analysis of the language would reveal the correct one. In these cases, it is best to take a guess and move quickly on. You don’t have time to dwell on the difficult ones. Make sure you get the easy stuff right first. The gist of it is this: practice is absolutely vital. Additionally, you need to be familiar with hearing English, with exam techniques, and with listening for specific details in both conversations and monologues. Get used to the format of the IELTS exam and the wording used in listening questions, and then on exam day you must read these instructions very carefully. It is easy to make small, silly mistakes.